On the ground and in the air, Frontline Energy Services (FES) is committed to increasing efficiency, safety and consistency for utility service providers. The company has evolved from a small, rural pipeline installer to a holistic project management firm. A major part of this evolution has been the adoption of mobile technology. 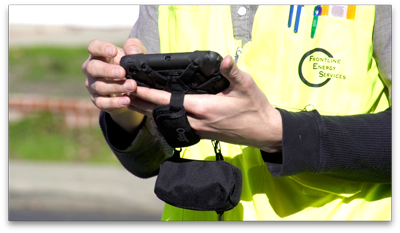 Using Apple iPad and iPad mini devices equipped with OtterBox Defender Series protection, the firm can offer a level of data analysis new to this stalwart industry. Products/services: Provides mapping, data collection and analysis services to the utilities industry. Now exclusively focused on data solutions, FES came from the field – giving the company a deeper understanding of what the utilities industry needs. The company was founded in Flagstaff, Ariz., providing utilities construction services. FES Founder Brian Herzog saw an opportunity to vastly improve the industry through a more strategic approach to construction, maintenance and monitoring. Today, FES provides a host of data-driven solutions to its utilities customers with a goal of making the industry more efficient, less reactive and safer. This evolution has been made possible by advancements in technology. By equipping field technicians with the proper technologies, FES can garner real-time data used to avoid major outages, predict maintenance issues and assess risk. In addition to providing real-time data capture and feedback, the tablets have replaced huge reams of paper maps. The first application for FES was monitoring underground utilities from the air. Aerial patrollers for FES cover 7,000 miles per month in helicopters and fixed-wing aircraft. Their main focus is pinpointing any potential threats to existing natural gas pipelines. Following the success of that first program, FES built additional capabilities for terrestrial monitoring, meter observation and other data applications. By early 2014, the company had grown its iPad and iPad mini fleet to about 400 devices. The iPads eliminated more than just paper. Much of the work had to be collected in the field and then entered in the office. Data collection is much more efficient now, with a single touch point. Deploying hundreds of devices with custom software applications isn’t an easy task. One thing that Dave Veilleux, senior technical consultant and manager of IT infrastructure for FES, knew was that the iPads would need to be protected. FES is coupling the rugged OtterBox Defender Series case with the Utility Series Latch carrying accessory to offer trusted protection with convenient in-field use. The Defender Series features multiple layers of protection with a built-in screen protector, while allowing access to all features of the device. The Latch, which secures easily around the device corners, includes attachments for hands-free carrying. FES is paving the way for major changes in the utilities industry using mobile technology, with plans to accelerate new programs to provide an even greater level of service. OtterBox premium solutions facilitate that advancement by protecting the company’s investment and allowing mobile technology to go further.